CONSIDERATION – Engagement with product promotion for calls to action. What is the strategic approach for your company? 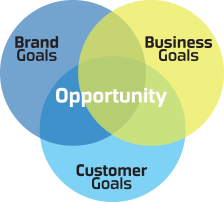 Let us work with your competitive advantage to develop the strategic roadmap and message clarity. Fragmentation Is the Reality. Integration is Your Strength. We are here to make these new marketing channels work for you. We create powerful, creative brand and marketing campaigns that transcend the media and device. By integrating the campaign across all channels, we bring the marketing message intact to all of your target customers. Great design starts with the way your target audience wants to connect to your brand.